If you haven't received an MLM pitch once in your life, chances are you're living under a rock. I've got some friends, people who I like and respect, hawking everything from shampoo to wax warmers in my social network feeds. They're great people, but I stand by my belief that these parent companies are just awful for our relationships and our pocketbooks. Have you ever been annoyed by a friend giving you an MLM sales pitch? Use the hashtag on Twitter and Instagram #justnoMLM to tell me about it! #5: It's not really about the product, it's about recruiting. The big problem with MLMs is their unsustainable business model. By focusing on recruitment, they spread the potential buying pool so thin that individual distributors have a hard time selling. The Problem with Primerica: The real problem with Primerica's products. Before joining an MLM, ask yourself: are the products really that competitive? Makeup at Dior / Chanel prices, without Dior or Chanel quality or brand value. Home and health/beauty products, comparable to drugstore items, at 3x drugstore prices. $22 bottles of juice. Who wants to buy $22 juice from a catalog? If you are determined to buy overpriced juice you can get it for $6.50 at the juicepress or $4 at CVS. Life insurance and investment products, at fee structures that make Wall Street hedge funds look like charities. If you're the kind of person who would knowingly subject your friends to this for personal gain, you're actually evil. Wax warmers and bars of scented wax. Do you need a wax warmer? Even if you answered yes, do you need more than one? What's your yearly budget for scented wax? Leggings. While by far the most plausible product I've seen so far, it's also the worst deal for the consultants, who MUST buy inventory, and do not even get to choose their inventory. Since leggings aren't consumable, it's a safe bet that your friends will reach legging capacity at some point, and you'll be the one left with a closet full of unsold leggings. The products simply can't compete. They aren't meant to compete. This, of course, isn't an issue for the parent company, who makes their money on selling products to overly-optimistic new distributors. Heads they win, tails you lose. 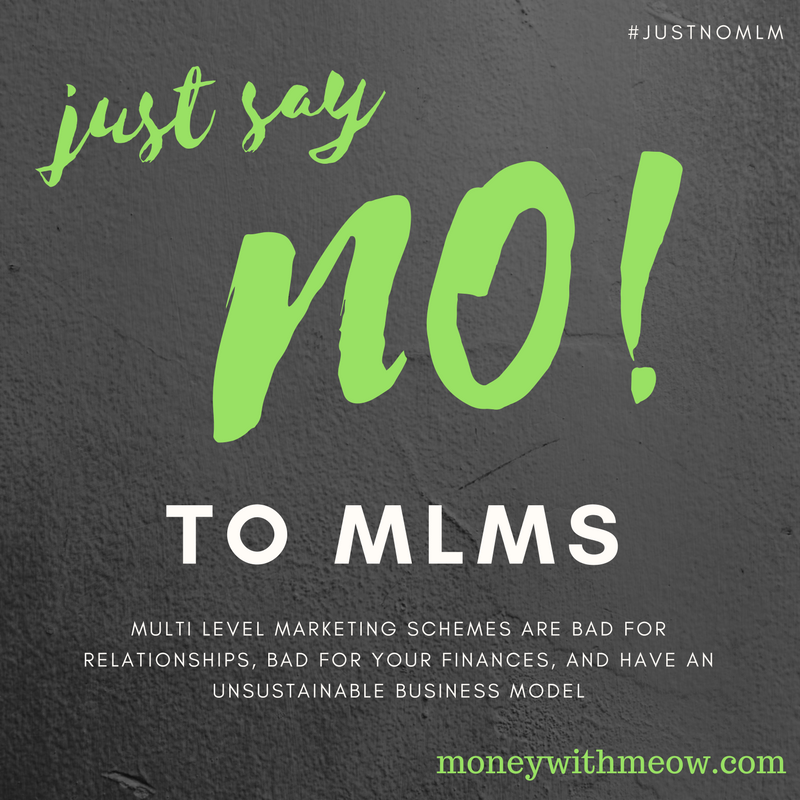 #4: The MLM doesn't have your back. "Independent Consultant" is just that: independent. You sign away your rights when you become a consultant. You can still be sued, ... and you're taxed on your earnings at the painful rate of a self-employed individual. And health insurance/benefits? You're on your own. While you're enthusiastically turning yourself into a sales pitch, your friends are cringing. Your social media posts become just another advertisement to ignore. When you sell to your friends, they may feel socially obligated to buy from you (products that are very marked up, or that they didn't need or want in the first place), and this leaves them feeling used. Nobody wants to feel like a cash cow to be milked. This sort of thing deals serious blows to your social armor. Even if your friends are into it too, you'll find yourselves buying from each other as favors. If that's the case, why not just give each other cash without the MLM taking their cut? You'll have a lot fewer unwanted wax warmers lying around too. While you're out pounding the pavement, recruiting, and harassing your friends, you could have been been building relationships, working a job for an hourly rate, learning about a field by apprenticing, or going to school. Or you could have stayed in bed playing video games instead of figuring out how to move the $4000 worth of leggings in your closet. Though it will be pitched to you as an investment, you put yourself at risk when you take your own money and tie it up in inventory. It takes those funds out of your personal cashflow and puts it into a very risky, totally not-diversified investment. Almost like a negative emergency fund! What if something comes up and you need that money right away? It's untouchable until you sell the products, and who knows when that will be- could be years! What happens to a lot of people in this situation? They end up discounting the inventory at a loss, just to make it move so they can get some of their cash back out of it. Of course, the parent company wins either way- they got your money up front, long ago. The problem of overbuying inventory is a killer for small businesses. I saw this happen to a family friend who ran a store at the mall. On her buying trips to South America, she got carried away with all of the beautiful inventory she could pick up for her store and sell at higher prices. When something came up, like an unexpected tax bill or a rent increase, she couldn't afford to pay it, because the IRS and the Mall Managers don't accept payment in Peruvian Artisan Jewelry: only cash. And converting that inventory to cash took time. But maybe an MLM is right for you? There is an exception to every rule. 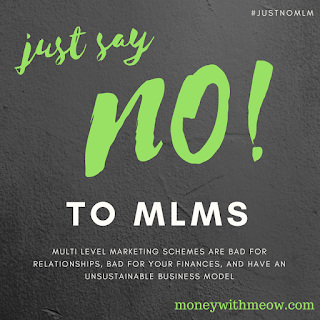 If you're the type of person who has a large and not-easily-offended social network which you don't mind milking, and you enjoy the thrill of the chase when it comes to sales, and you literally have nothing better to do, maybe you can do well at an MLM. However, don't be fooled by the stellar descriptions of people who have earned financial freedom that way: you're better off playing the lottery, or trying to become an NBA star. Even if they show you a big fat check, that's gross earnings: how much came out of that check to cover advertising, travel, wholesale cost, taxes, and so on? If you've ever been a part of an MLM and got out, or if you're part of one now and totally love it, I'd love to hear your experiences in the comments. 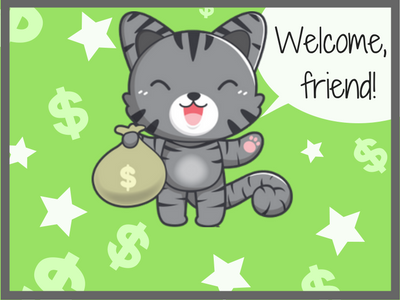 You can also catch me on Twitter @moneywithmeow. I got caught up in an MLM program years ago when I was still in college. It was a company called Quixstar or something like that which was website selling pretty much everything (This was back in around 2000 so internet shopping was still relatively new). It seemed amazing because you'd get a cut of whatever people buy from you as well as people under you. Like you said, the products can't compete. And it seemed like their main goal was to sell you CDs/books to teach you to sell and to sign people up to sell.